We also want to spend every waking moment with them to watch them grow, develop, and learn. However, the unfortunate truth is that around-the-clock attention just isn’t always possible. With work, errands, and other daily necessities getting in the way, it can be difficult to spend as much time with our children as we want. Fortunately, there is a way that they can still get the love, attention, and care that they require during their formidable years. 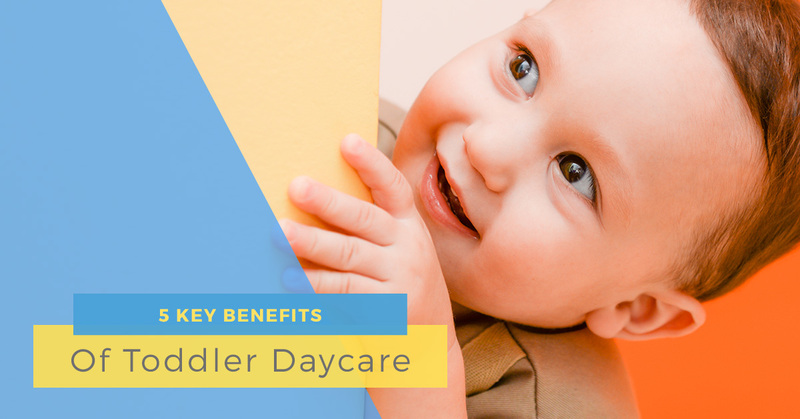 It’s called toddler daycare, and while this isn’t a new and novel concept, it is one that we put a lot of time and effort into as part of our Lake Worth preschool programs and more. At Kidstown Learning Center, we believe that toddlers have an innate desire to explore and discover the world on their own, which is why we take a more specialized and beneficial approach to our toddler daycare. Our daycare specialists will take the time to provide the excellent care you want for your child in a fun, exciting, and cheerful learning environment. While you may be hesitant to leave your child somewhere else throughout the day, you can rest assured that Kidstown is qualified to provide and nurture your child the right way. Still want to learn more about toddler daycare? Here are five key benefits that you should know about this program. Routine: You can’t overstate the importance of putting your child on a regular schedule for learning and growth. Toddler daycare provides an opportunity for your kid to get accustomed to a regular routine, which includes a multitude of activities which can lead to growth and education. Having some daily structure, even before they know how to tell time on their own, can help them stay organized and comfortable. Learning: A U.S. National Institute of Health study showed that more than 90 percent of children who scored higher on cognitive and academic tests had been involved with high-quality daycare as toddlers or young children. That just goes to show that the preschool programs are more than just a place for kids to play and nap — they are a place to learn and thrive. Social Interaction: Another key benefit of toddler daycare is the amount of social interaction they are exposed to. Spending time with other kids of the same age, particularly in a supervised and safe environment, allows your child to grow in other ways. They can learn key life skills early on, such as sharing, compassion, and even problem solving. Furthermore, this can help them develop their personality. Smooth Transition: Kids who are involved in toddler daycare and other preschool programs are known to have an easier time making the transition to kindergarten when the time comes. That’s because they already know how to handle the structure, how to interact with kids and adults alike, and how to open up their minds to learning. Happy Home Life: While you may have a hard time dropping off your child for their regularly scheduled daycare program, they will eventually become anticipatory and excited. What’s more, they will be excited for you to pick them up and bring them to another comfortable, nurturing environment — your home. Your kids will learn the benefits of playing and learning, thus leading to a home life filled with love and joy. At Kidstown Learning Center, our Lake Worth toddler daycare program is second to none. We want to see your child thrive, and with the help of our qualified and knowledgeable teachers, they will get all of the tools and support needed to do just that. Learn more about our Lake Worth preschool program, toddler daycare, infant daycare, and more and enroll your child today.